It uses Tahki Donegal Tweed but it'd look great in other worsted yarns. 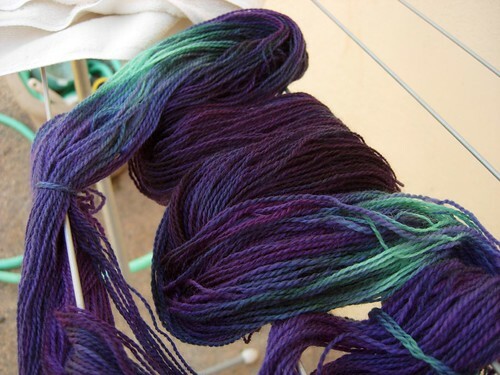 My first yarn dying attempt came out nicely. Goal Color: 1/2 Purple and 1/2 Dark Purple. Actual Colors: Different Shades of purple all over with some charcoal, blue, and mint green. The green is going to stay due to popular vote. The colors remind me of the Carribean and of Northern Lights. A quick images.google.com lookup lead to this wonderful Northern Lights in Norway I envy Norwegian knitting skills and Norwegians can actually use woolies, so Norwegian Northern Lights it is. Next dye project will probably be with Kona Superwash DK and Wilton's Greens or ProChem OneShot. I like how the Kona feels once washed. Continue reading Norwegian Northern Lights. This page is a archive of entries in the sharp points category from May 2006.
sharp points: April 2006 is the previous archive. sharp points: June 2006 is the next archive.